* Xperia users having problems with the stock Xperia widgets not working, please take a look at the second post. OnOffTools - OnOffTools needs to be installed as a system app (push to /system/app and set correct permissions) if you want to toggle GPS and/or NFC with it! - Fixed: Icon packs are listed more than once if they support more than one launcher. - Fixed: Force Close when entering Launcher Settings -> GENERAL in case the icon pack that is currently in use is uninstalled. If you would like to help in translating the app, please add your translations HERE. I am an avid user of your Xperia S launcher and admire like anything. just wishing your good luck ahead . Xperia launchers are my favorite as they are less on RAM. WOW.. what a great work MAN. hats off. 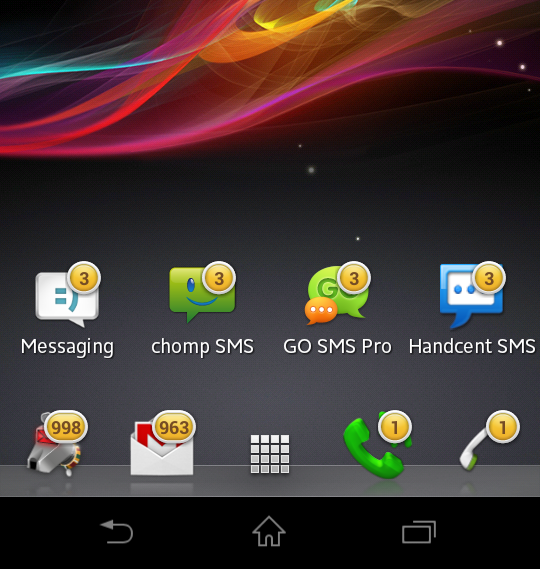 the only thing i hated in previous Xperia S launcher was dock background color which was a nuisance ( allow me to say this as many people wanted a transparent dock) and you DID it Man. 5 ***** . you made my day as this is only using 15 mb ram on my Micromax A90s . i believe that with new editions you will be able to reduce the RAM. The title has tomorrow's date, so I'd say it will be added tomorrow 11/30. Use this xperia launcher in the mean while. awesome work!!! so which Xperia widgets are compatible with this launcher? hmm only xperia launcher ? where's home add & home preferences ? I'll be adding some widgets shortly. Home add and preferences are integrated in the app.